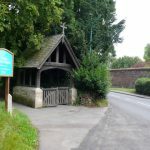 It would seem, from such evidence as can be drawn from the few surviving records, that a church or chapel was built or existed on the site of the present church around 1250 AD. 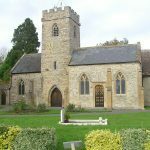 So, as is typical, in particular across the whole of southern England, worship at Staplegrove within a form of the present church has continued since at least early Norman times. Nikolaus Pevsner in his series of famous treatises on Architectural Britain sadly gives only a very brief and hasty description and suggests that the “simple profile” of the chancel imposts (arch and columns) “seems to belong to c 1200. The rest largish and essentially 1857”. However, the collective view of most authorities, who have studied the architecture of the building, suggests that the lower parts of the tower and main aisle are of 13th and 14th century origins, the remainder being later additions as the centuries go by, principally from the restoration of 1857. 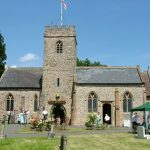 Certainly four of the six bells in the tower give the definite date of their casting as being 1608, replacing earlier bells of the mid 1500s, thus partially confirming the view that the tower and main aisle were largely as they are now at that date. One interesting point of note is that the main church doorway was that at the base of the tower, which acted as a porch, with a now blocked up inside doorway into the church midway along the south side of the main aisle. 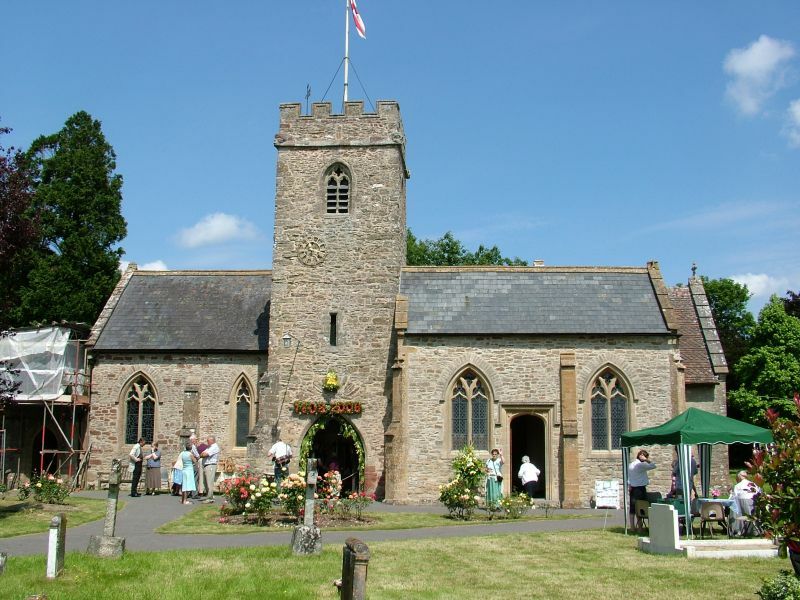 The church then underwent a major restoration in 1857, but sadly because of administrative oversights the architectural plans for the work, that would normally be held by the Bishop, are missing. This is a particular loss because these plans would normally include not only the new work to be undertaken but also the plan of the existing building before the new work began. A lot else besides is missing in regard to our Church of St John The Evangelist. One of the main reasons for the lack of documentation, especially in the Middle Ages, when so many other ecclesiastical institutions were well recorded, is thought to be due to the make up of the local population. 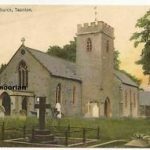 There were no major estates or local landowners of great repute and so little endowment was bestowed upon the Church, such as would be found in the wills, documents and records of the landed gentry and their families. 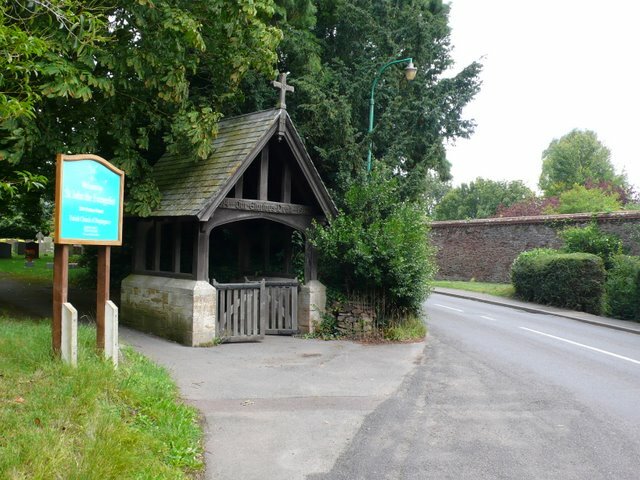 As a result there is no ‘collateral’ evidence from family collections of what was happening in the locality, of which the church would be the central establishment for most communities at that time. 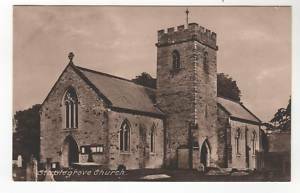 A booklet is available from within the Church porch for around £2.00 sketching the history and development of Staplegrove Church, written by Derek Shorrocks and published in 1992. 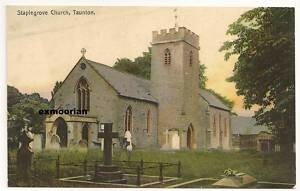 The four oldest Church bells were cast in Taunton in 1608 by George Purdue, probably in our churchyard. June 2008 saw the celebration of the 400th Anniversary of their casting and hanging. A major Festival was held over the week-end of 13th – 15th June 2008 with fun and games, a lot of ringing, including the visiting Lichfield Mobile Belfry, stalls and a hog roast on the Saturday evening. 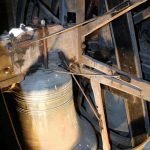 A book on the history of our bells, bell ringing and the lore of ringing is available from church contacts, or the Tower Captain and author Tom Harris as above. 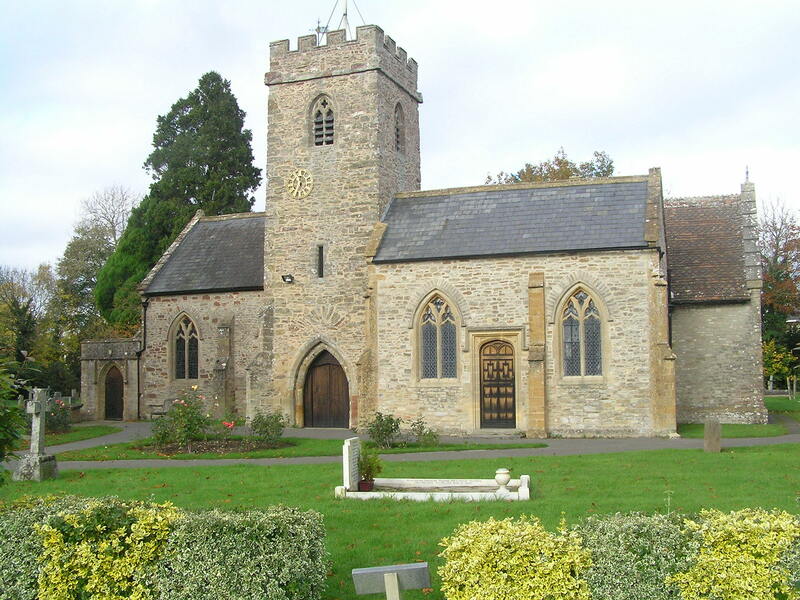 The first mention of Church bells at Staplegrove is in the 1585 – 86 Churchwardens’ accounts. 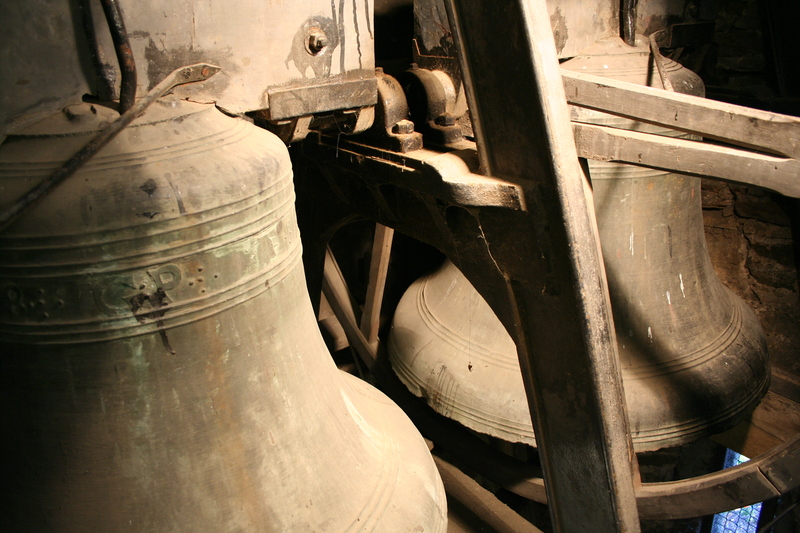 We also know from these records that three new bell ropes were purchased in 1590. 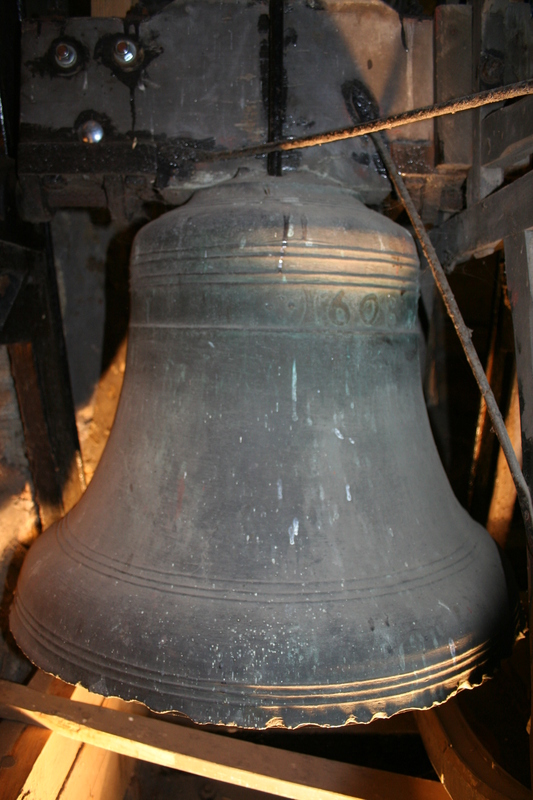 However, the four oldest bells now in the tower were cast in 1608 by George Purdue here in Taunton. 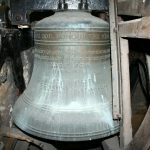 The 400th Anniversary of these bells was celebrated at a “Bells and Flower Festival” in June 2008. 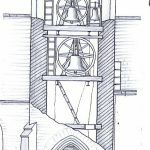 From deduction and historical precedence, it is reasonable to assume that there were only three bells in the tower until 1608, when it is likely that five new bells were cast and hung. 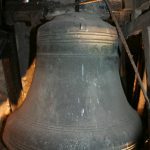 It is probable that all five were produced in 1608, but that the third, our present No 4 bell, cracked or failed in some way, and was recast by George’s nephew, William Purdue, as it dates from 1653. 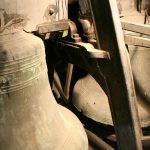 Bells have been hung in church towers since the mists of time and certainly back into the thirteenth and fourteenth centuries, though not rung then in the same manner as we think of traditional ringing today. 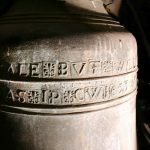 Our bells have interesting individual inscriptions. The earliest, 1608, castings are very rough, making the lettering difficult to decipher. 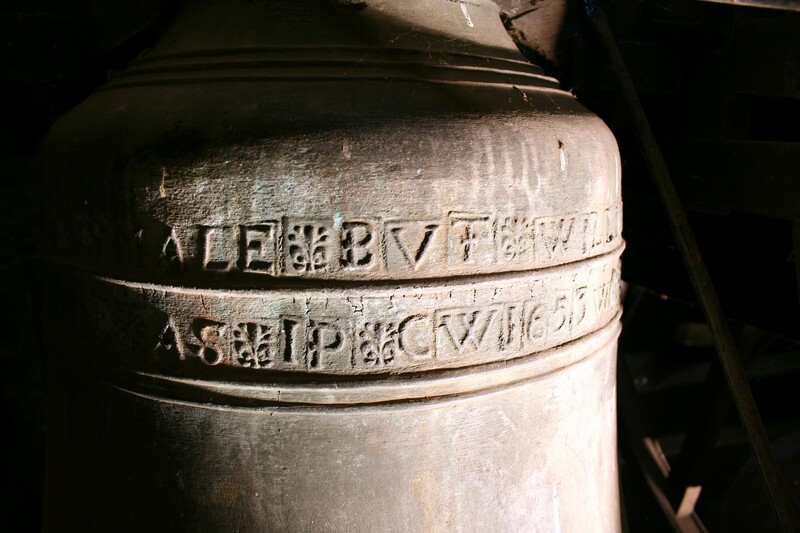 In addition to the script there are numerous small bell and cross-like signs between the words and dates, probably George’s ‘signature.’ The second and third bells, being fairly small, do not have a lot of room for many words and are simply embossed around the crown with the letters ‘G P 1608.’ On the larger fifth and tenor there is more room, with ‘PRAYSE YE THE LORD G P 1608’ and several of his small signs in between the words and numerals. The 1653 William Purdue bell has a rhyme about the problems of the time. 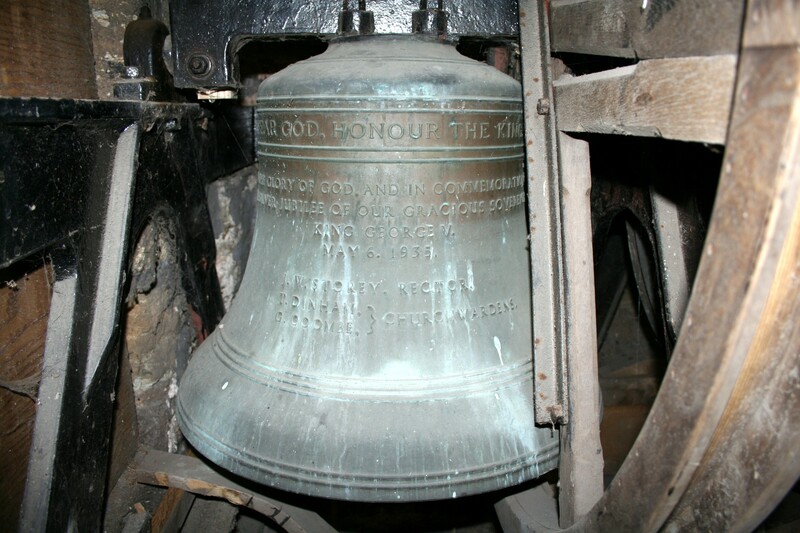 The treble, as the highest note and smallest bell is called, is a really modern little bell by comparison, being cast by the Mears and Stainbank, the Whitechapel Bell Foundry, in London with a suitable inscription, to mark the Silver Jubilee of King George Vth in 1935. 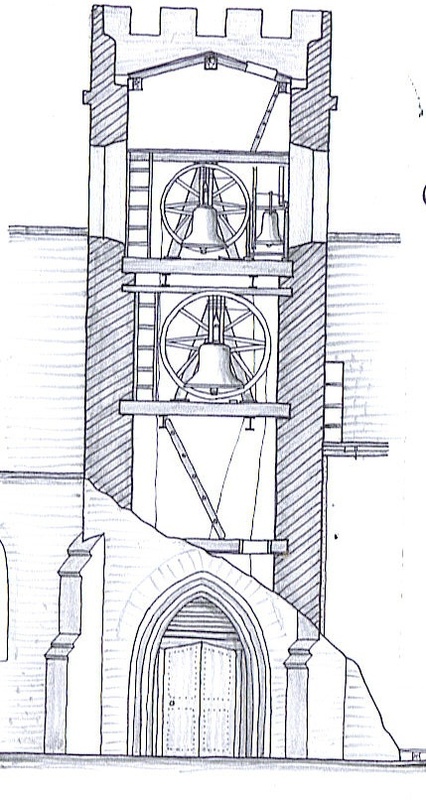 The bells are hung on frames on two levels in the tower. 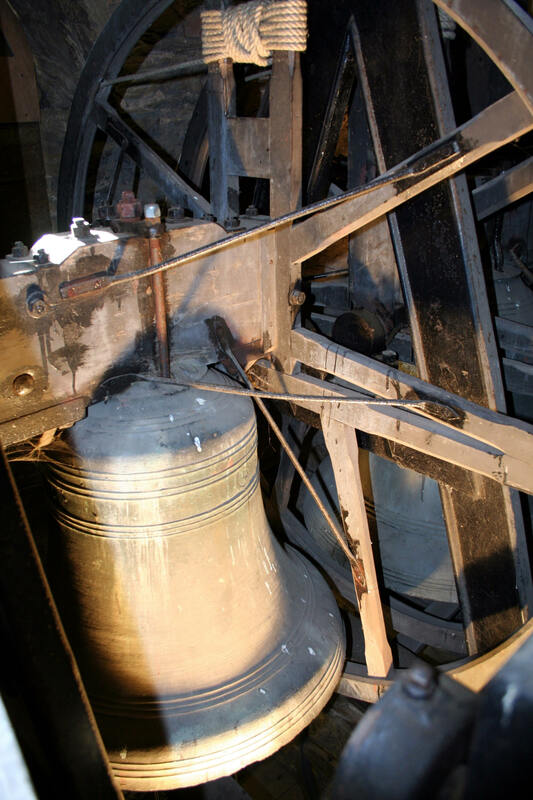 The two largest are on the lower level, roughly behind the clock, while the four smaller bells are all hung above these. The diagram has been drawn and kindly supplied by Michael Clark, longest serving member of Staplegrove ringers. The bells are tuned to the key of G#, vaguely. For additional details, how to find us, map references and contacts, please follow the link to the Bath & Wells Diocesan Association of Change Ringers website (B&WDACR) go to www.bath-wells.org.uk Under ‘Branches’ choose Taunton then select Staplegrove. There are also links within this site to the ‘Dove’ website.